We celebrated George's Birthday a little late because I was away. However, we all got together for our traditional Birthday Bear Lunch. This time we went to Salisbury Hotel. 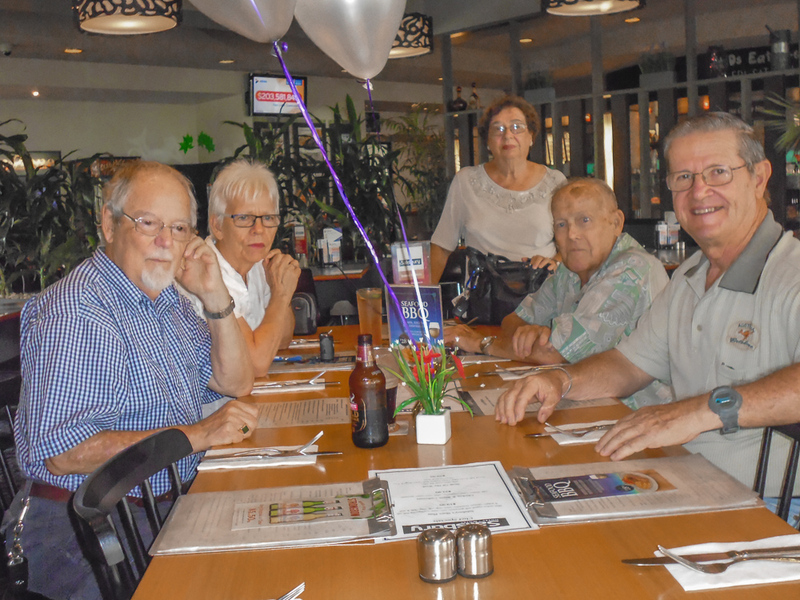 We were pleased with the service and the food was good too. We were all pleased to see Paul, who has cancer, was well enough to spend some time with us. George and Ann recently celebrated their 50th Wedding anniversary and it was my turn to dress bear to reflect something in George's life. 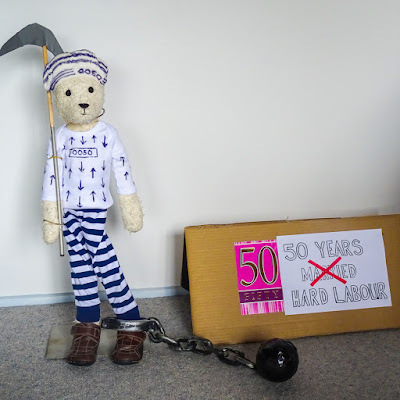 So Bear is dressed as a prisoner doing 50 years hard labour. He has a pick over his shoulder and a ball and chain attached to his leg. Wife, Ann giving him a hard time. It was fun dressing Bear for George. Bill, me, Helen, Paul and George. I forgot to take a shot of the whole group. Ann took this one but Mary and Ann are missing. Mary must have been ordering lunch. Love your Birthday Bear celebrations! Ha on the ball and chain for 50 years. George definitely doesn't look as if he has suffered too much from those 50 years of hard labor! Great idea for birthday bear - Happy Birthday to George. Hello, Diane! Happy Birthday to George! I would say 50 years of hard labor has been good to George. Cute Birthday Bear! Happy Sunday, enjoy your week ahead! 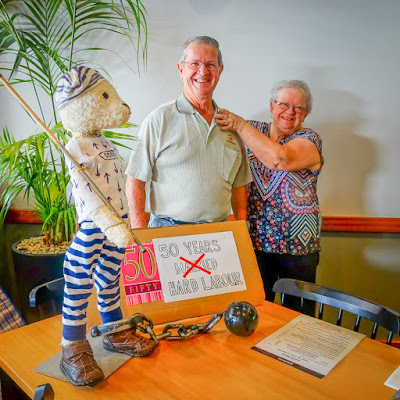 love the ball and chain joke.. they look like they have enjoyed their 50 years of hard labor and I wish them many more years. Funny! You all have such fun with the birthday bear and are so clever with your ideas. I'm glad your friend was feeling well enough to enjoy the party. Love your sense of humor Diane and I enjoyed the birthday bear photos. A lovely tradition! Glad to hear Paul was well enough to join in the fun. 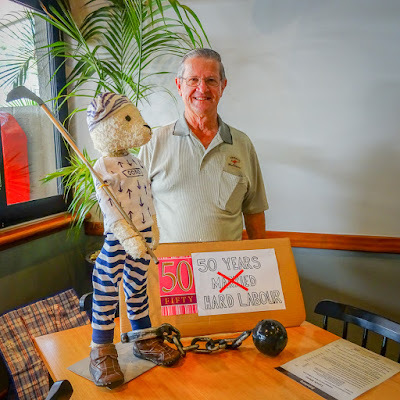 Your idea to dress bear as a prisoner is absolutely great ! I think I will get dressed like that on our 50th wedding day, lol ! 50 years? You get less for murder!! Congratulations. Cogratulations, 50 years is a long time. As always, Diane, yiu and yiur friends had a wonderful celebration. 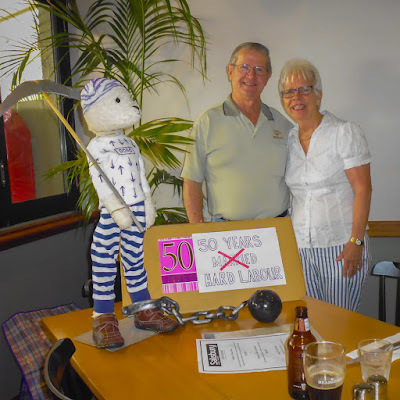 Birthday Bear's costume was well done and 50 years is quite an achievement...we shiuld all be so fortunate!